Natural blue wax made from high quality beeswax and tree resin. Thanks to the deposition temperature, which promotes skin pore opening, provides a very good even solid hair elimination. Made specially for body and face hair depilation. A natural wax made from high quality beeswax and tree resin. Thanks to the deposition temperature, which promotes skin pore opening, provides a very good even solid hair elimination. Made specially for body and face hair depilation. Natural wax yellow. 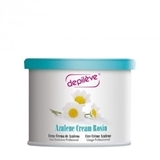 It provides an ideal hair removal results as well as soothe and nourish the skin. Natural wax black. 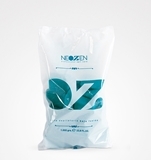 Natural wax and Azuline combination provides the ideal hair removal results as well as soothe and nourish the skin. For sensitive skin and it is suitable plans and medium thick hairs. Natural wax green made of high quality beeswax and tree resin. Thanks to the deposition temperature, which promotes skin pore opening, provides a very good even solid hair elimination. Made specially for body and face hair depilation. Wax disks. Soft touch and excellent application. It offers maximum efficiency even in the most unmanageable hair, thanks to its temperature application that allows total pore opening. Effective use in facial and body hair. Chocolate: wax with soft and tasty perfume. Thanks to its titanium content allows a particularly delicate tug, ensuring optimum results. Revolutionary disposable wax without bands for men. Effective with the more rebellious hair (beard, back, chest, ...), prevents the appearance of hair cystic thanks to Salicylic Acid that it contains. With Ginseng Oil, revitalising and refreshing. 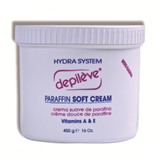 Formula with guaiazulene and titanium dioxide ideal for sensitive skin and sensitive areas. Recommended for use on face, underarms and bikini line. Salicylic Acid ( Folisan) Mica and Titanium Dioxide make this a unique formula to prevent ingrown hair and ideal for both men and women. Formula based entirely on synthetic rosin. The NG formula has an effective removal, leaving no residues. Has a very good pull but does not irritate the skin if reapplication needs to be done. With the “A”of vitamins, no heat effect. Deep mitrināša skin. Cold paraffin is recommended in cases where there are contraindications to heat procedures (sensitive skin, rosacea, etc.). The operation is similar to that from the hot paraffin-like appearance, but without the heat effect.Wax improves skin elasticity, prevents paraffin-like appearance has mitrinošaa and emollient effects, it contains natural plant oils has beneficial effect on the dry cuticle. The procedure makes skin soft and velvety. Paraffin and other hydrating ingredients, gives skin a ārkārtigu tenderness, as well as intensely moisturizes, soothes, smoothes and softens the hands skin. It is a good SPA procedure. Even after hand washing still sajūtīsiet that Your skin is well nourished and soft. As you know, after the rock may find out women of age !Treat your hands! Low melting point formula with extra pull formulated for brazilian waxing and underarms. 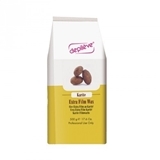 Enriched with Cacao butter and Oat extract for a protective moisturizing soothing effect. Directions: Warm up the wax in the warmer. 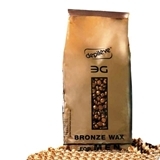 Notice that the wax is not too hot and apply on skin following the hair growth. Choose the size of the area according to your wish. Apply a thin layer. Wait until wax is hardened and does not stick to fingers anymore. Remove wax pulling its own sides. NB! This wax does not need wax stripes for its removal. Formulated with Pure Shea Butter, specially recommended for those professionals that prefer the consistency of traditional waxing with the hygienic advantages of strip waxing. 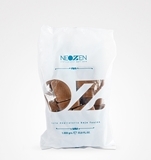 500 gram bag in Beads for faster meltdown and quantity desired. Melting point: 39°C. New delicate formula for sensitive skins. Gently removes hair. This all-purpose rosin is effective on legs, bikini line, underarms, and facial areas and leaves the skin smooth and soft.